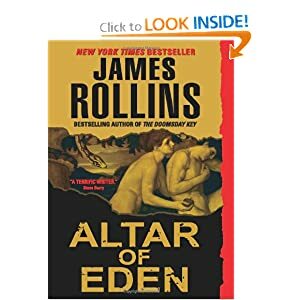 The last time I read a James Rollins novel, I promised myself that I would make sure to keep him on my reading list. Alter of Eden was the first that I’ve come across in a while and am truly glad I did. Inside the Louisiana swamplands, an evil escapes and death is about to reign across the land. The question is, which is more evil, the beast that’s gotten free or its creators. It took me a total of five minutes to get hooked on this book and set it down only when kicking and screaming didn’t work. I enjoyed it and would recommend it to anyone who enjoys a good mystery and willing to get scared by the possibilities of what science can do when it goes un-checked. Click on the hyperlink above and order a copy today. You’ll be glad you did.